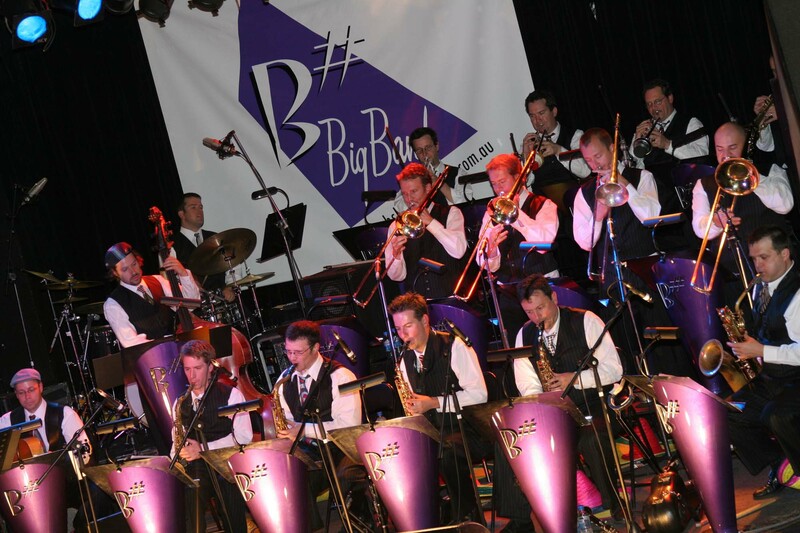 Brought together by the Big Band passion of Henry in 2003, the emergence of the B# Big Band has been widely anticipated by jazz, swing and dance fans all around Melbourne. B# are a dance band, a lounge band and a functions band…. A band that guarantees to get toes a-tapping and hearts a-pounding. B# have set their sights on bringing you the music and professionalism of the great swingin’ Big Bands – Basie, Ellington, Lionel Hampton, Harry James, Gene Krupa, Benny Goodman, Glenn Miller, Ray Anthony, Harry Connick and others. Whether it's the 8, 10 or premium 17 piece line up, the excitement's always quick to get pumpin' and the dance floor quick to get jumpin'! Needless to say though, the band's 'dinner music' brackets (when requested), are very light, sweet & smooth, allowing guests to mingle and easily converse. Whether the band's cruisin' or pumpin', B# always hosts the ‘cat’s pajamas’ of vocal talent, including: Julie O’Hara, Fiona Thorn, Emma Franz, Hetty Kate, Frank Benedetto, Eugene Hamilton, Rod Gilbert and David Dean (aka Dean’s Martini). David Campbell, Ross Wilson, Tom Burlinson, Bob Downe, Tim Campbell, Monica Trapaga, Mark Holden, Jane Clifton, Joe Camilleri, as well as international stars Wayne Bergeron, Wycliffe Gordon & Lorna Luft have also featured as guest vocalists with B#. And speaking of honoured guests, Australian jazz virtuoso, James Morrison has performed with the band on several occasions.